Welcome back to the Trillium Dental blog! If you read part one of this blog series, you already know how regular dental cleanings can greatly reduce your risk of developing cavities, gingivitis, and moderate- to late-stage periodontal disease due to tartar buildup along the gum line. As it turns out, there are many other benefits of professional teeth cleanings, which we will continue to discuss throughout this post. Here are a couple more reasons why teeth cleanings are critical for good oral health. During a professional dental cleaning, your dental hygienist will scope out your teeth, gums, and surrounding tissue for underlying issues that may not have been brought to your attention yet. The early signs of many oral health conditions, like developing cavities or mildly receding gums, tend to go unnoticed until your dentist takes a closer look during a hygiene visit. Other, more serious oral health conditions, such as jaw bone deterioration, are detected via X-rays, and it’s tools like these that allow dentists to discover the warning signs early-on. As mentioned in our previous post, gingivitis, or early-stage gum disease, can be treated and even reversed if it is caught early enough by a dentist or dental hygienist. Given that gingivitis begins when something is irritating your gums (like plaque and tartar), the severity of gum disease is highly contingent on your oral hygiene habits and how often you visit the dentist for professional teeth cleanings. The same goes for cavities, bone deterioration, broken fillings, or any other oral health issue; early detection and treatment of these conditions greatly increases your chances of effectively remedying, or even reversing, the damage done to your gums and teeth. In addition to detecting oral health issues early on and providing the appropriate treatment, your dental hygienist will also take preventative measures to protect your teeth and gums. One of the most common preventative methods used today is the application of dental fluoride, which helps protect your teeth from cavities for the first few months between professional teeth cleanings. Here in Ottawa, this mineral is found in our water and food, which also gives us a small boost of oral protection. However, this is not nearly enough to rely on, and it is still highly recommended to have fluoride applied to your teeth by a dental hygienist during a hygiene visit. Much like an annual doctor’s appointment, regular dental appointments also provide the opportunity for you to get professional advice about how to improve your oral hygiene habits moving forward. Whether this means adjusting to a more frequent flossing schedule or switching to a brand of toothpaste that better suits your needs, our dentists and dental hygienists at Trillium Dental are always happy to provide our insight and guidance. We understand that prevention is far easier and less expensive than most treatments for oral health conditions, so feel free to ask us how you can better protect and care for your teeth and gums at home. Our dentists and dental hygienists are always available to help you and address any concerns you might have, as this could mean the difference between a dangerous, worsening oral health condition and early detection and treatment by a dentist you trust. All things said and done, regular dental appointments are one of the best ways to protect your teeth in the long run. 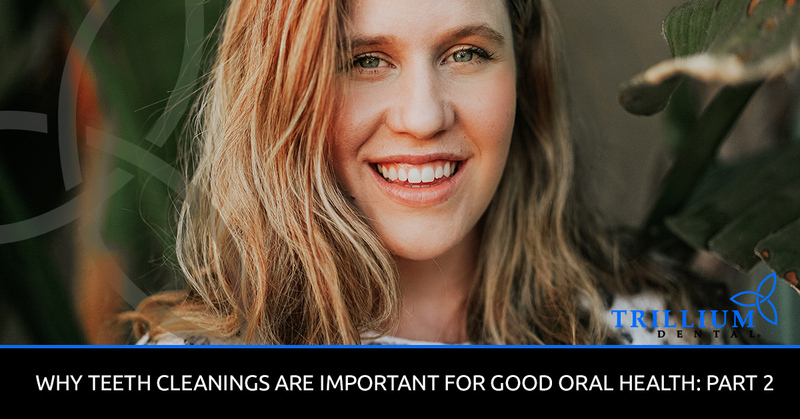 From removing tartar and reducing your risk of developing gum disease to providing preventative measures, early detection, and treatment for oral health conditions, there are many reasons why professional teeth cleanings are critical for good oral health. It all comes down to prioritizing the health of your mouth and entire body, and taking the steps necessary to ensure that you are receiving the proper dental care. If it’s been a while since your last hygiene visit, or you think you may be experiencing issues with your teeth or gums, schedule an appointment with Trillium Dental in Ottawa today! Our dentists and dental hygienists would be happy to clean your teeth and provide you with all the resources you need to maintain your oral health.